There are common traits that are identifiable in artists who push past the boundary of arts many genres and types: be it portraiture, still life, landscape, and abstraction or realism. A few examples of these common traits are the demonstration of a high degree of technical skill at a young age, or a childhood event that acts as a catalyst. This catalyst often manifests as an internal calling to seriously pursue an education and career in the visual arts. In the case of the Sydney-based artist Stephen Hall, it happened during his childhood (1967-1974). While living in the isolated rural area of Broken Hill, his mother, a practising artist introduced him to art through a diverse collection of art reproductions, stored in an old suitcase. For Stephen, as a child, these reproductions, with their creased corners and faded colour, were like strange ancient artefacts. They acted as a magical gateway to a lost civilisation, and he felt a deep connection with this lost world. This diverse collection of art reproductions, both in artistic style and from different time periods, ranged from the flat imagery and distorted scale of animals in the Lascaux Cave Paintings– Hall of Bulls (c. 15-18,000 B.C), minimalist colour and subtle light used in Honoré Daumier’s painting Don Quixote (1868). As well as the influence of atonal musical compositions in Wassily Kandinsky’s geometric abstract painting series Composition I–Composition X (1909-1939). And there were images closer to home with the integration of Australian history and experience in the early paintings produced by Russell Drysdale (1953-1960). Many young aspiring artists would regard this collection of imagery as nothing more than a brief snapshot of art history. In spite of this Stephen Hall viewed these images quite differently, by realising that these different visual concepts functioned in a more interesting way together than as separate artworks. Years later, he would find assurance and common purpose with the Russian composer Alfred Schnittke (1934-1998). Through the way, he juxtaposed an elegiac tone with polystylistic satire, abruptly combining contrasting musical genres, and breaking every rule in classical symphony arrangement as fast as he could. Music has always had a strong relationship with the visual arts. Evident in how they both share technical terms such as composition, discord, harmony, scale and tone. Another rarely discussed fact is that music is often the only form of companionship, which an artist has during their cloistered stint in the artist studio, lasting days, weeks, sometimes even months. Such isolated activity is often the sign of a broken person — comparable to prolific readers of literature — except that stitching together the fragments of meaning in the world is projected outwards not inwards. It is a matter of producing art not consuming it. Producing the type of art that has genuine emotional and social content (often straying far away from social trends). Artworks with a social conscience that walked in a stride of independence such as Francisco Goya’s Los Caprichos series (1796-97), and Edward Keinholz’s State Hospital (1964-66). They acted as a signal for Hall in what his art could aspire to be like. These influences would end up having a profound effect on Hall’s art practice and would provide the impetus for him to seek out his artistic independence. Stephen Hall’s art practice focuses mainly on drawing and mixed media painting but occasionally expands his practice to include printmaking, ceramics and sculpture. From an early age, he displayed a high aptitude for drawing, sidestepping reliance on drawing from life or the use of photography. Instead, he placed emphasis on memory, feelings, impulse and amalgamating different artistic styles into his artwork that developed into the visual grammar and vocabulary of his idiosyncratic drawing style. These factors contributed to Hall joining the stable of artists at the well-known Coventry Gallery in Paddington. He exhibited at the Coventry Gallery for four years (1986-1990), which included a successful solo exhibition and participating in the group show Colour II (with Matthys Gerber and Mike Nicholls). Although he soon became disenchanted with the commercial aspect of visual arts, taking an extended hiatus, and not before long, became occupied with a seventy-hour work schedule and raising a young family. Despite the long break, Hall’s creative impulse was always lurking beneath the surface exterior of domestic life. As a way of reacquainting himself with the visual arts, its histories and practice, he studied Fine Arts (Diploma level) at Meadowbank TAFE (1996-97) and continued his studies as a Master of Art candidate and a Master of Fine Art (Research) candidate at the College of Fine Arts (COFA), University of New South Wales (2001-04). While studying at the College of Fine Arts, he became increasingly frustrated, partly because he was constructing and deconstructing imagery through expressive line and mark-making with such ease. And for such an extended period, that his drawings began to take a progressive detour from what was expected within the boundary that frames contemporary drawing. Visual art is considered a visual language and the drawing medium is one of its oldest dialects. And through the space of time, drawing has constantly adapted to new environments from our ancient past with cave drawings to modern science evident by diagrammatic illustrations. However, drawing has always been characterised by its sense of immediacy and its physicality, emanating from the deltoid and trapezius muscles in the shoulder and back, streaming down to the flexor digitorium muscles near the wrist. The physicality of drawing can portray narrative without the need for other visual references (contrary to Greenberg’s formalist position and Krauss’s post-medium theory). On the other hand, visual references plays an important role in academic study of the visual arts and often art institutions (like the College of Fine Arts) can be tightly confined within their academic dogma and may lack the intellectual reach to see an alternative point of view. Fortunately, Hall found the flexible attitude he needed in Professor Peter Pinson, who urged him to start entering his artwork in the Blake Prize for Religious Art. For five consecutive years, Hall was a finalist for the Blake Prize (2002-2006). During this time he reached a new tier of artistic maturity evident in three solo exhibitions unified by theme: Madness, Violence, and Absurdity (Part 1-3), held at the Beatty Gallery, Sydney and the Wall Gallery, Melbourne (2003-2006). Quickly followed an invitation by his former art theory teacher Dr Carol Elvin to accept a casual teaching position (art theory and drawing) at the Nepean Arts and Design Centre (N.A.D.C). In 2009, a tempestuous storm of success and tragedy thundered into Hall’s life. His monumental drawing Mumbai or Merry-Andrew Always Plays a Straight Bat & Sheds a Tear in Passing (2009) became a finalist work in the Dobell Prize for Drawing (2009) held at the Art Gallery of New South Wales. This mixed-media drawing referenced the Lashkar-e-Taiba shooting and bombing attacks across Mumbai in 2008 and incorporated the philosophical theme about a joyful moment that quickly shifts to a grave catastrophe. Its narrative about global events and the serious subject matter were a stark contrast to the timid landscape drawings and cookie-cutter expressive portraits that would frequently appear in this drawing prize year after year. 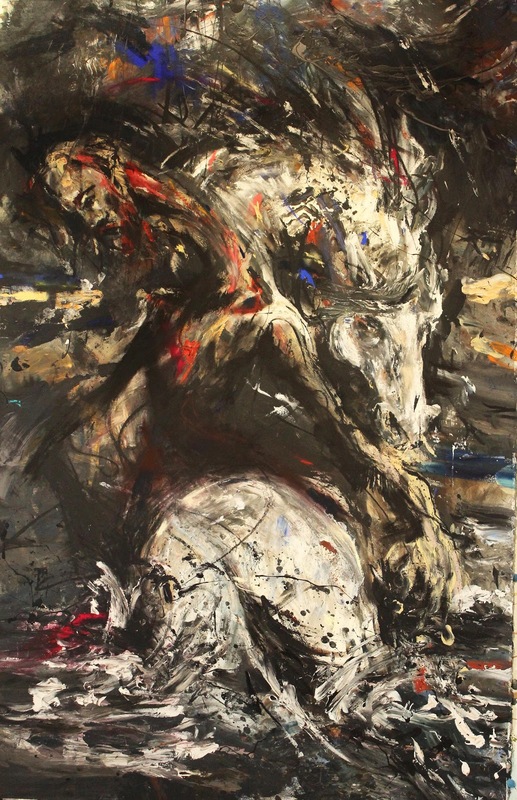 More success would follow, this time personal work with darker themes: the apocalyptic drawing The Limner and his Steed Rest (2010) and the epic drawing The Limner passes through the Eternal Battle (2011) both finalist works at the Dobell Prize for Drawing (2010-11). His latest exhibition Merry-Andrew the Limner: Through Water (2014) was held at the Sheffer Gallery, Sydney. A collection of drawings, mixed-media paintings and ceramic pieces that explored the theme of water, through metaphor, visual poetics and myth and how it relates to social and environmental issues. James Aksman-Glosz is the Featured Artist curator for Issue 16. James is an arts writer and a practising artist whose work places emphasis on painting, drawing and printmedia. He holds a Bachelor of Visual Arts (Painting) from Sydney College of the Arts, University of Sydney. Previously he studied at Kunstakadamie Düsseldorf. With further study at the Sydney Gallery School and at the NADC (Nepean Arts and Design Centre). More recently he was the Master Printer for Matthys Gerber with the works being exhibited in Hot Art—Cold Market (2012), Institute of Contemporary Art Newtown (I.C.A.N), Sydney. This entry was posted in Issue 16, James Aksman-Glos, Stephen Hall and tagged Alfred Schnittke, Art, Australian Art, Coventry Gallery, Edward Keinholz, Francisco Goya, Honoré Daumier’, Lascaux Cave Paintings, Russell Drysdale, Wassily Kandinsky by Mark Roberts. Bookmark the permalink.